This course project was undertaken by myself and four other students and involved examining self-promotion attitudes and strategies of Flickr users in the context of computer mediated communication. 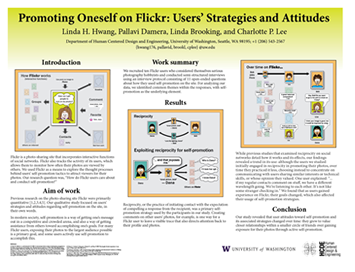 We initially developed our project proposal based on the initial research question, "What methods do people use on Flickr to gain visibility for their photographs?" A literature review concerning this topic was undertaken by the group to see if any research had been done on this topic, and to help build a solid foundation for this project. We felt that the best way to gain insight and data concerning this topic was through personal interviews. 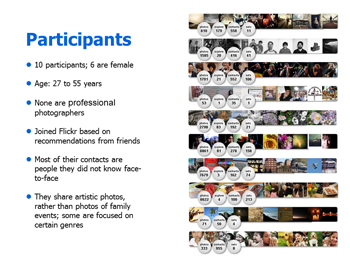 We iteratively developed an interview protocol and recruited 10 Flickr users for the study. I conducted two of the ten interviews, one in person and one over the phone. I then transcribed my interviews from the audio recordings. As a group, we analyzed the data by identifying themes and frequency of mentions within each of the interview questions. 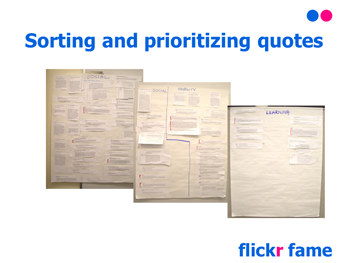 Interesting and relevent quotes from participants were presented by each of the researchers to the group as a whole. We found this to be a little studied area, and that there were specific attitudes and strategies used by the participants. We realized that our initial research question needed to be revised to, "How do Flickr members care about and promote popularity?" With popularity defined as " the degree to which a person's identity and content is know to others." We found that in new Flickr users popularity was important, however users attitudes changed toward this over time. After users became more experienced and/or gained popularity, learning and social interactions became more important for these Flickr users. These findings were presented in a paper and a powerpoint presentation. Drawing upon the results of this research, a small group of the researchers prepared this data as an extended abstract for submission to the poster presentation section for Group '10, a conference that promotes the bridging between computer supported collaborative work and information systems. The abstract was accepted and the poster was presented at the Group '10 conference.